Buckeye Nuts - Quarter Size - One Hundred Nuts by Ohio Buckeye Company at Smokey Robinson Foods. Hurry! Limited time offer. Offer valid only while supplies last. These rich brown buckeye nuts have been thoroughly dried and are ready for use. They are clean and smooth with no cracks, squirrel bites or mold. These rich brown buckeye nuts have been thoroughly dried and are ready for use. They are clean and smooth with no cracks, squirrel bites or mold. Buckeyes can be made into necklaces and other jewelry items to show your support for Ohio State University. They can be used for crafts, party favors, wedding table centerpieces, holiday garlands and more. 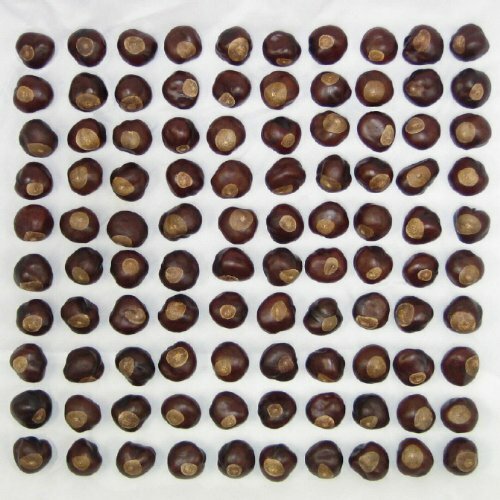 This listing is for twenty-five buckeye nuts that are quarter size or larger. The buckeye nut has a rich, mellow, warm-brown shell highlighted by a beige eye. They resemble the eye of a deer and get their name from the Indian word hetuck which means eye-of-a-buck. Ohio is known as the Buckeye State, the buckeye is the official state tree and Ohio residents are commonly known as Buckeyes. Folklore says that buckeyes bring good luck and prevent rheumatism, arthritis and headache. Many OSU fans wear buckeye jewelry to bring their team good luck. The buckeye is a relatively new symbol at OSU. During the 1920s the buckeye gradually assumed an unofficial role as a school symbol. The buckeye's five-fingered leaflets, along with the nut were adopted by the University as its official symbol in 1950. Today this stylized buckeye emblem assumes a prominent place at the base of the University's seal. The first buckeye leaf decals appeared on the helmets of the 1967 OSU football team and are still awarded to players today for execution of an exceptional play. In 1965 the Buckeye was named Ohio States mascot by the OSU athletic council. The buckeye mascot was later named Brutus Buckeye in an all-campus naming contest. The Ohio buckeye was popularly accepted as the State's symbol during the late 1800s but was not formally adopted by the Ohio legislature as the State Tree until 1953 on Ohio's 150th anniversary of statehood. Buckeyes are poisonous and should not be eaten; they are for craft and decorative purposes only. The buckeye nut has a rich, mellow, warm-brown shell highlighted by a beige eye. They are great for making necklaces, other jewelry and craft projects. The buckeye's five-fingered leaflets and nut were adopted by The Ohio State University as its official symbol in 1950. Brutus Buckeye became The Ohio State University mascot in 1965. Folklore says that buckeyes bring good luck and prevent rheumatism, arthritis and headache. View More In Mixed Nuts. If you have any questions about this product by Ohio Buckeye Company, contact us by completing and submitting the form below. If you are looking for a specif part number, please include it with your message. Azar Nut Santa Fe Adobe Snack Mix, 5 Pound - 2 per case.